A cup of masala chai. Masala chai (Hindi (मसाला चाय [masālā chāy], "spiced tea") is a milky black tea beverage, sweetened and spiced deriving from India. By itself, the term chai is merely the generic word for tea in much of the world, but for many English speakers outside those regions, "chai" is always construed as "masala chai." This way of drinking tea emerged during the British control of India, at a time when the British East India Company encouraged the consumption of black tea. In order to reduce the amount of tea needed per cup, vendors used their creativity to add spices as well as milk and sugar to the drink. The result was a delicious spiced beverage. In its simplest form masala chai is prepared by boiling a mixture of water and milk together with loose tea leaves and whole spices. The leaves and spice residues are then strained off before serving the beverage. Varied combinations of spices bring an almost infinite variety to this drink. In India, where it is traditional to serve masala chai to guests, each family has their own unique recipe. The serving of this drink has no special ritual, such as is found in other cultures, for example the Japanese tea ceremony, but is simply offered and enjoyed in many forms and situations. Masala chai has become an essential part of the culture, such that chai wallahs offer the beverage on many street corners providing welcome refreshment to passers-by. Masala chai (Hindi (मसाला चाय [masālā chāy], "spiced tea") is a beverage from the Indian subcontinent made by brewing tea with a mixture of aromatic Indian spices and herbs. Masala (Urdu: مصالہ‏); Hindi: मसाला) is a term used in South Asian cuisines (including Indian, Bangladeshi, and Pakistani cuisines) to describe a mixture of spices. Chai is ultimately from the Chinese word chá (茶) meaning tea. The Chinese character for tea is 茶, but it is pronounced differently in the various Chinese dialects. Two pronunciations have made their way into other languages around the world. One is tê, which comes from the Amoy Min Nan dialect, spoken around the port of Xiamen (Amoy). This pronunciation is believed to come from the old words for tea 梌 (tú) or 荼 (tú). The other is chá, used by the Cantonese dialect spoken around the ports of Guangzhou (Canton), Hong Kong, Macau, and in overseas Chinese communities, as well as in the Mandarin dialect of northern China. This term was used in ancient times to describe the first flush harvest of tea. Another pronunciation, which has not spread to other languages, is zu, used in the Wu dialect spoken around Shanghai. The traditional chai (tea) brewing process in Russia and India actively boils the tea leaves over sustained heat. Chai prepared in this manner has nearly the same amount of caffeine as coffee, as the prolonged boiling produces a more robust beverage than quiescently steeping the tea leaves in hot (but not boiling) water. In much of South Asia, chai is almost as popular as coffee, and street vendors called chai wallahs ("tea persons") are a common sight in many South Asian neighborhoods. In India, young chai wallahs can be found on street corners brewing tea in kettles and brass pots. The tea is mixed with milk and sugar and sold to passers-by in small earthenware cups that are discarded after use. For many English speakers outside those regions, the term "chai" is synonymous with "masala chai." The term "chai tea" is sometimes used to indicate spiced milky tea as distinct from other types of tea. Coffee houses may use the term "chai latte" for their version to indicate that the steamed milk of a normal cafe latte is being flavored with a spiced tea concentrate instead of with espresso. Tea plants have grown wild in the Assam region since antiquity, but historically, South Asians viewed tea as an herbal medicine rather than a recreational beverage. Some of the chai masala spice mixtures in current use are still derived from Ayurvedic medical texts. Masala chai has always been prepared in a variety of ways with a wide range of spice, and served both hot and cold. In the 1830s, the British East India Company became concerned about the Chinese monopoly on tea, which constituted most of its trade and supported the enormous consumption of tea in Great Britain. British colonists had noticed the existence of the Assamese tea plants, and began to cultivate tea plantations locally. Over 90 percent of the tea consumed in Great Britain was still of Chinese origin in 1870, but by 1900, this percentage had dropped to 10 percent, largely replaced by tea grown in India (50 percent) and Ceylon (33 percent). However, consumption of tea within India still remained low until an aggressive promotional campaign by the (British-owned) Indian Tea Association in the early twentieth century, which encouraged factories, mines, and textile mills to provide tea breaks for their workers. It also supported many independent "chai wallahs" throughout the growing railway system. The official promotion of tea was as served in the English mode, with small added amounts of milk and sugar, and the Indian Tea Association initially disapproved of independent vendors' tendency to reduce their usage (and thus purchases) of tea leaves by adding spices and greatly increasing the proportions of milk and sugar. However, masala chai in its present form has now firmly established itself as a popular beverage, not just outlasting the British Raj but spreading beyond South Asia to the rest of the world. Today in India it is traditional to welcome guests into one's home with cups of masala chai; each family having their own recipe and method of preparation. A boy in Mysore, India preparing masala chai. The simplest traditional method of preparing masala chai is to actively simmer or boil a mixture of milk and water with loose leaf tea, sweeteners, and whole spices. Indian markets all over the world sell various brands of "chai masala," (Hindi चाय मसाला [chāy masālā], "tea spice") for this purpose, though many households blend their own. The solid tea and spice residues are strained off from masala chai before serving. The method can be varied according to taste or local custom: For example, some households may combine all of the ingredients together at the start, bring the mixture to a boil, then immediately strain and serve; others may leave the mixture simmering for a longer amount of time, or begin by bringing the tea leaves to a boil and only add the spices toward the end (or vice-versa). There is no fixed recipe or preparation method for masala chai and many families have their own special versions of the tea. However, all masala chai has four basic components: Tea, sweetener, milk, and spices. The base tea is usually a strong black tea, such as Assam, so that the various spices and sweeteners do not overpower it. The dry tea should have a strong aromatic scent with dominant tobacco and floral notes. However, a wide variety of teas are used to make chai. Most chai in India is brewed with strong black tea, but Kashmiri chai is brewed with gunpowder tea. 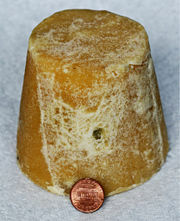 A block of Indian jaggery. Plain white sugar is sufficient, although individual tastes may favor the caramelized notes from Demarara, other brown sugars, palm or coconut sugars, or the more complex slight acidity of honey. In India, a form of unrefined cane sugar called Jaggery or gur is commonly used in masala chai. This type of sugar is a concentrated product of cane juice without separation of the molasses and crystals, and can vary from golden brown to dark brown in color. A surprisingly large quantity of sugar may be required to bring out the flavor of the spices; one recipe uses three tablespoons of sugar in 3.5 cups of chai. When using condensed milk for the milk component, it also doubles as the sweetener. Usually, whole milk is used for its richness, but any milkfat concentration or non-dairy milk (soy, rice) will do. Generally, masala chai is made by having 1/4 to 1/2 parts milk mixed with water and then heated close to or to boiling temperature. Condensed milk may be used in masala chai, which also doubles as the sweetener. The traditional masala chai is a bracing, strongly spiced beverage brewed with so-called "warm" spices. Most masala chai incorporates one or more of the following: cardamom, cinnamon, ginger, star anise, peppercorn, and cloves. Cardamom is a dominant note in traditional chai masala. Ginger, black pepper, and cloves are also used in Indian masala mixtures and cuisine. Having ginger or black pepper is considered important as it gives chai a slightly spicy flavor. In India, for example, fresh ginger is usually used. Other spices that may be used to produce different flavors include Ajwain (a relative of caraway), allspice, coriander, chocolate, fennel, licorice, nutmeg, and vanilla. In Western India, mint leaves are also considered a major ingredient among the spices. The Kashmiri version of chai is brewed with green tea instead of black tea and has a more subtle blend of flavorings: Almonds, cardamom, cinnamon, cloves, and sometimes saffron. In Malaysia, strong tea is mixed with thick condensed milk and sugar. The mixture may be poured back and forth several times between two jugs to produce a delicious frothy, sweet beverage. In the western world, Masala chai comes in a variety of forms, many of which bear little resemblance to the traditional Indian beverage. Western commercial preparations such as Oregon Chai and Tazo use non-traditional ingredients such as vanilla or chocolate, relegating the traditional masala spices to a relatively minor role. During the Christmas season, a quick chai can be made by combining plain tea with eggnog as a convenient pre-spiced, pre-sweetened dairy product. Sometimes, non-tea-based variants are prepared with herbal tisanes such as rooibos, and even with the South American beverage mate. American coffeehouses offer a version of masala chai augmented with espresso, called "java chai," or many other different names. Liquid "chai concentrates" have become very popular for their convenience, as these spiced, sweetened, tea-based syrups merely require dilution with milk, water, or both to create a flavorful hot or cold beverage; most coffeehouse chains generally use commercial liquid concentrates instead of brewing their own chai masala from scratch. Dry powdered or granular mixes similar to instant coffee are also commercially available. Both dry instant mixes and liquid concentrates can be replicated at home. Unsweetened iced-tea powder can be tailored to individual taste with powdered spices, sugar, and dry nonfat milk and dry nondairy creamer; the result can be mixed with hot water to produce a form of instant chai masala. This form of dry mix has the disadvantage that the powdered spices may leave an unpleasant grainy residue at the bottom of the cup. Also, when making a cold drink it may dissolve poorly in cold water, especially in the presence of dry milk/creamer powders. Many Western supermarkets sell pre-packaged single-serving teabags of "chai." The packaged directions generally call for steeping the small bag of ground spices and tea leaves/dust in a cup of hot water for several minutes longer than plain teabags. American supermarkets may also carry bottles of "chai spice" alongside their dried herbs and other spices. Unlike Indian spice mixtures, the American ones are generally made from powdered spices (and sometimes sugar) and can be added at the last minute to an already-brewed cup of tea as there is no need (or way) to strain off the solids. As an alternative to the hot tea format, several types of cold "chai" beverages have become popular in the United States. These range in complexity from a simple spiced iced tea without milk to the elaborately caloric "chai tea frappuccino blended cream" mixed with ice and milk in a blender and topped with whipped cream. ↑ 1.0 1.1 1.2 Lindsey "Vee" Goodwin, Masala Chai, VeeTea, Oct 29, 2007. Retrieved February 23, 2009. ↑ "Chai,", The American Heritage® Dictionary of the English Language, Fourth Edition. Houghton Mifflin Company, 2004. Retrieved February 23, 2009. ↑ Östen Dahl, Feature/Chapter 138: Tea, The World Atlas of Language Structures Online, Max Planck Digital Library. Retrieved February 23, 2009. ↑ Merriam-Webster Online, "chai," Merriam-Webster Online Dictionary, 2009. Retrieved February 23, 2009. ↑ 5.0 5.1 Jane Pettigrew and Bruce Richardson, The New Tea Companion (Perryville, KY: Benjamin Press, 2008, ISBN 978-0979343179). ↑ Lizzie Collingham, Curry: A Tale of Cooks & Conquerors (New York, NY: Oxford University Press, 2006, ISBN 0195172418), 187-214. ↑ 7.0 7.1 Candie Yoder, Masala Chai, Culinary Teas. Retrieved February 23, 2009. ↑ Practical Answers, Brown Sugar. Retrieved February 23, 2009. Collingham, Lizzie. Curry: A Tale of Cooks and Conquerors. New York, NY: Oxford University Press, 2006. ISBN 0195172418. Goodwin, Lindsey "Vee." Masala Chai. VeeTea, Oct 29, 2007. Retrieved February 21, 2009. Heiss, Mary Lou, and Robert J. Heiss. The Story of Tea: A Cultural History and Drinking Guide. Berkeley, CA: Ten Speed Press, 2007. ISBN 1580087450. Yoder, Candie. Masala Chai. Culinary Teas. Retrieved February 23, 2009. This page was last modified on 31 August 2018, at 14:41.